The author wishes to acknowledge Carole Osborne-Sheets for masterminding the Somato-Emotional Integration Modality that was used in this study. She also wishes to show appreciation for the efforts of Jack Baker and Joanne Odenthal for their tireless guidance and much needed assistance with the creation and completion of this study. Objective: This study investigated the efficacy of a specific massage therapy procedure on alleviating the frequency, intensity and duration of tension-type headaches and the chronic low back pain of a test subject. Methods: The subject reported experiencing 5+ headaches per week and almost daily lower back pain for the previous six months. Frequency, intensity and duration of headaches and back pain was recorded in a daily pain journal for a baseline period of two weeks prior to the five weeks of massage treatment. Manual therapy was administered once weekly; each session lasted sixty minutes and consisted of a structured protocol directed toward integration of the physical body and the conscious mind. Results: During baseline, the headache frequency was established at an average of 5.6 incidences per week and low back pain occurred at an average rate of 3 days per week. After the first week of treatment headache incidence was reduced to and remained at an average of 1.5 incidences per weeks and back pain decreased to an average of 1 incident per week. 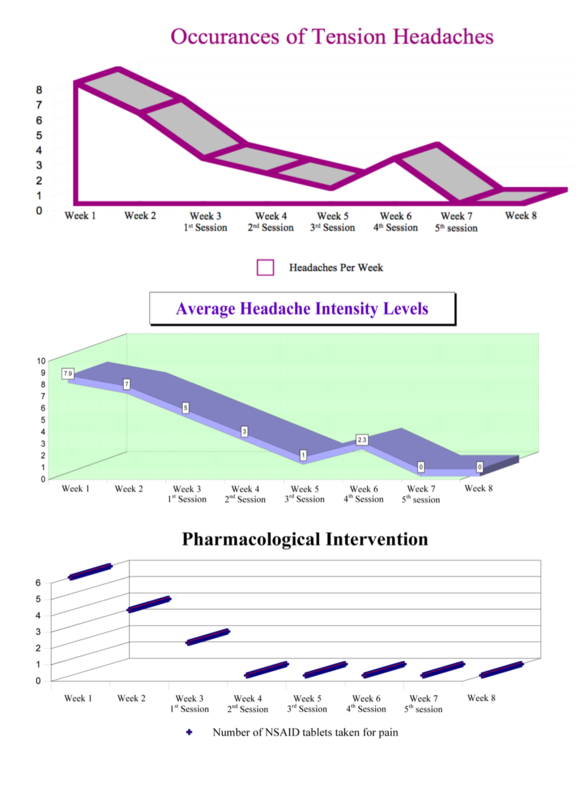 During the treatment period there was a decrease in the intensity of headaches from a level 7 to a level 2 and the use of NSAID pharmacological intervention decreased from 4 pills per week to 0. Conclusion: The somato-emotional integration massage therapy techniques used in this study have the potential to be a functional, non-pharmacological intervention for reducing the incidence of tension headaches and chronic low back pain. Key Words: Somato-Emotional Integration, tension headache, chronic back pain, emotional release, massage, body-mind. Throughout time touch has been implemented in an effort to comfort, heal and to relieve pain. Touch triggers both metabolic and chemical changes in the body that promote healing (Davis, 1991). Many researchers have discovered that massage therapy shows promising results with regards to chronic pain management (Tsao, 2007). Nearly a quarter of all adult Americans (twenty four percent) had a massage at least once in the last 12 months, and more than a third (thirty four percent) have received a massage in the last five years, according to a survey sponsored by the American Massage Therapy Association® While use of massage is growing, the reasons people are turning to massage therapy are also expanding. More and more, people recognize massage as an important element of their overall health and wellness. There is a clear trend in America today: more people than ever are turning to massage therapy for pain relief. Nearly one-third of adult Americans say they’ve used massage therapy at least one time for pain relief. Of the people who had at least one massage in the last five years, 30 percent report that they did so for health conditions such as pain management, injury rehabilitation, migraine control, or overall wellness (2007 Massage therapy consumer fact sheet). Emotional tensions are often the main source of physical tension (Kurtz, 1990). Traditionally, emotional release has been achieved through the practice of psychotherapy. In Western civilization, psychologists have predominantly used talk therapy to help their patients release emotional distress. However, some psychotherapists are turning to alternative therapies to complement talk therapy and possibly enhance the overall therapeutic result (Collinge, 2005). Somatic authors have observed that many of the most important discoveries in psychology have increased relevance when grounded in the experience of the body (Maupin, 2000). Emotional reality and biological ground are the same and cannot, in any way, be separated or distinguished (Keleman, 1985). Our thoughts and feelings influence the body via two mechanisms: the nervous system and the circulatory system. These are the pathways of communication between the brain and the rest of the body (Collinge, 1996). Over two thousand studies regarding mind-body medicine have been published in the last twenty five years. These studies demonstrate through the use of measurable diagnostic tests, that mind-body interactions are real and can be measured (Jacobs, 2001). As Collinge notes, this fact is being recognized in the medical establishment. As evidence he quotes Dr. Kolk, director of the TraumaCenter in Boston: “Current research concludes that traumatic experiences involve the whole person’s emotions and feelings (mind, body and spirit). It is believed that traumatic experience is evidenced at the biochemical/neuromuscular levels and that treatment must integrate cognitive- based narrative therapy (psychotherapy/counseling) with somatic body memory treatment” (Collinge, 2005). Through the process of receiving massage, many clients discover unconscious tensions, recall memories of past events, or release suppressed emotions (Davis, 1991). Emotional trauma sustained in accidents, loss of loved ones, violent natural or interpersonal experiences and repeated abuse or deprivation often profoundly impact the body’s soft tissue. Through mindful and respectful bodywork, a client is allowed to express these deeply rooted emotions and in doing so, the client’s current stresses and their associated psychological traumas can melt from the body’s soft tissues with a resulting sense of relief and resolution (Osborne-Sheets, 1990). The clients physical body responds to mind/body therapy rapidly by manifesting positive changes in his or her mood, pain level, or other physiological body functions (Collinge, 1996). Somato-Emotional Integration is a bodywork modality that promotes body awareness through deep tissue sculpting and various other massage therapy techniques with the intention of interfering with the client’s long held physical and intellectual defenses, thereby allowing deeply rooted emotions to emerge from the body. Through massage techniques, awareness, breath work and guided imagery, Somato-Emotional body work promotes integration of the client’s physical, emotional and intellectual experience of her being (Osborne-Sheets, 1990). One of the areas where massage has proven effective is in treating chronic pain, and two chronic pain conditions are addressed in study: tension headaches and low back pain. Chronic pain is a serious health condition that approximately fifty million Americans live with daily (Menard & Piltch, 2008). Chronic pain is characterized by pain that continues a month or more beyond the usual recovery period for its cause, or pain that goes on for months or years because of a chronic condition (Goodrich-Dunn, & Greene, 2004). Often, no initial cause for the pain is identifiable. When there is no obvious physical injury, muscle tightness due to stress, anxiety and/or depression is often believed to be the source of the pain (Goodrich-Dunn, & Greene, 2004). Chronic pain is a major cause of absenteeism in the workplace. One common chronic condition is tension headaches. Tension headaches are defined as headaches that are triggered by mechanical stresses that initiate central nervous system changes in serotonin levels and blood vessel dilation (Werner, 2005). Any kind of ongoing mental or physical stress can change postural and movement patterns, which will lead to muscle spasm. These sustained muscle contractions are often the culprit behind chronic tension headaches (Werner, 2005). Since chronically constricted muscles may reflect chronically constricted emotions (Osborne-Sheets, 1990), it is reasonable to assume that somato-emotional bodywork could provide relief from tension headaches. It has been observed that relaxing from the inside out, rather than from the outside in seems to be important to headache prevention and relief (On the Mark, 1996). The most common type of chronic pain is back pain (Menard & Piltch, 2008). Massage therapy has been shown to effectively reduced the symptoms of chronic lower back pain (Field, Hernandez-Reif, Krasnegor, & Theakston, 2001). Interventions such as relaxation techniques, stress reduction and conflict management have all been used to help alleviate back pain in direct patient care-givers with great success (Williams, 2007). Therefore, low back pain that has no obvious physical cause may be relieved through somato-emotional bodywork. Researchers have identified how the ways that we cope with emotions and stressful situations can influence our physical health (Collinge,1996). There is growing evidence that massage and other forms of bodywork beneficially complement traditional medicine. A rising number of conventional healthcare companies now offer complementary alternative medicine to their subscribers (Vanderbilt, 2006). Although there have been many studies done to support the relevance of massage therapy, most have focused on the efficacy of massage for treating medical conditions (Moyer, 2004). Virtually no scientifically based research has studied Somato-Emotional Integration as a specific modality. More research is needed to explore the full potential of psychologically based bodywork. The objective of this study was to determine if a specific massage therapy program could have beneficial effects on the frequency and intensity of tension headaches and chronic low back pain. A two-week measurement period prior to treatment was used to establish baseline measures. Following the baseline period, a five week treatment program that incorporated somato-emotional body awareness techniques and full-body therapeutic massage was initiated. Post session measurements continued for one week following the treatment program. Profile of the client: A thirty year old, married mother of two had been experiencing at least four tension headaches episodes per week for the past six months. She had also been experiencing chronic pain in her lower back. A visit with her regular physician determined that the subject’s pain was not the result of any physical ailments. The subject reported occasional use of over the counter non-steroidal anti-inflammatory drugs (NSAID) in conjunction with a microwaveable heating pad and stretching exercises to alleviate her lower back pain as recommended by her physician. She was instructed to continue with pharmacological treatment as necessary, but not to begin new pharmacological intervention related to headaches or the back pain during the course of this study. It is interesting to note that the client was a body worker who had a very strong body-awareness and was able to give the practitioner very anatomically specific feedback throughout the course of this study. Study Overview: The eight-week study consisted of baseline headache and back pain measures recorded during the first two weeks, followed by once weekly, one-hour Somato- Emotional Integration, massage therapy sessions for the remaining five weeks of the study. Beginning two weeks prior to the first session and continuing one week beyond the final session, a daily log book was completed by the subject each evening before retiring for sleep and each morning upon waking. The logbook recorded the frequency and intensity of the day’s headaches, as well as the frequency, intensity and location of the day’s back pain. The duration of the subjects sleep hours and any pain related interruptions of the subject’s sleep patterns were also noted. In addition, the subject made note of any pharmacological intervention that was used to alleviate pain on the occasions that she resorted to using them. Headache and backache intensity was determined by the subject drawing a mark along a visual analog scale ranging from 0-10 centimeters, with descriptors at each end. The left side (or zero station) indicating no pain and at the right side (or ten station) indicating the worst possible pain. The distance from the zero point to the subjects mark was measured in centimeters. The subject noted the location of her back pain by drawing mark that corresponded with her own body on a pain diagram that consists of two sketches of the human body, both in anatomical position, one prone and one supine. Treatment Plan: In this study, the client received a total of five, one-hour Somato- Emotional Integration sessions. The bodywork sessions were conducted once a week for five weeks consecutively and were separated by at least 120 hours and no more than 168 hours. Each session begins with greetings and a preliminary intake that consists of verbal interaction as well as visual observations. The therapist orients the client to the procedures and obtains permission to touch. At this stage the frame of mind that the client is in is defined as “Ordinary Awareness.” This term is used to describe a person who is behaving as they normally would, in an outwardly oriented, goal directed manner. Their awareness is usually narrowly focused and ruled by habits and routines in space and time (Barstow & Johanson, n.d.). The second phase of the session begins with breathing exercises and light effleurage as the parasympathetic nervous system are stimulated and the client settles into a more relaxed state and begins to have more body awareness. The massage therapist makes contact over the heart chakra, and may lead the client in a breathing meditation. At this point the client is entering what is referred to as the “Witness State,” which is defined as the client experiencing a mindful consciousness that can simply stand back and observe the inner experience without being caught up in it (Barstow & Johanson, n.d.). During the third phase, which constitutes the bulk of the session, the client is usually completely in witness state. At this time the massage therapist incorporates bodywork techniques such as deep tissue compressions, sensory repatterning, and passive joint movements as she sees fit, directed by the emotional and physical cues expressed by the client. The massage therapist listens attentively and asks open ended questions to promote the client’s thought process and possible emotional release. The therapist may also use visualizations, past incident processing or body part dialogue as a tool to further explore an area of interest in the clients body. During this phase the therapist may observe the client express his/her “Inner Child,” a state of consciousness in which the client is aware of their current adult status and at the same time is experiencing the memories, feelings, thought modes and speech patterns of childhood (Barstow & Johanson, n.d.). During this phase the client is most likely to experience emotional processing or what is known as “riding the rapids,” a state of consciousness characterized by the loss of mindfulness, uncontrollable emotional release, spontaneous movements and tensions, waves of memory and feeling, and the use of tension and posture to control the flow of feeling (Barstow & Johanson, n.d.). The massage therapist is present as a non-judgmental support system, to assist with the client’s processing and to keep the client safe on the table. The last phase of a somato-emotional session is closure. The client is told that their time has come to an end, and the massage therapist will check-in to be certain that the client is ready to move on from the subject matter that they were working with. Closing the session involves making tactile contact with the whole of the body with the intention of grounding the client and helping the client return to ordinary awareness. This contact may include effleurage, palm presses, passive movement or zone therapy reflexology on the feet with an emphasis on bringing the client’s attention back to the present and their awareness and their breath back throughout their entire body from head to toe. Finally the therapist will make contact with the three center (head, heart and lower abdomen) in a final act of integrating the entire body. When the bodywork session is complete, the client is left alone to get up off the table and to dress. Once they are ready, the massage therapist discusses any revelations that occurred during the session. The client is often asked what they would like to remember from the day’s work and to speak it aloud. Then the massage therapist will repeat that back to the client in order to solidify the memory. Finally, pleasantries and goodbyes are exchanged and the client leaves. The massage therapist then documents the client’s progress using a Somato-Emotional Integration specific log, in order to record what occurred before, during and after each session. Session 1: The client arrived reporting pain and discomfort in the gluteal region due to increased physical fitness training. After the initial greetings and touching-in described in phases one and two, the practitioner focused on releasing the muscles in the gluteal region using a combination of deep tissue compressions and passive joint movements. During the course of these compressions the subject experienced visual images that she connected to a source of emotional stress in her life, in addition to muscular release in the area. While processing the manifestation of stress in the gluteal region, the client’s shoulders became tight and her right shoulder became noticeably elevated. The client confirmed that she was experiencing pain in that area. After treating both shoulders with deep tissue compressions and skin rolling, the client reported that the discomfort was moving down her arms, so the therapist continued the deep tissue work down each of the subject’s arms and out to the ends of her finger tips. As a result, the client noticed a searing pain in her IT band near where her hand was laying at her side. In this area the therapist used deep tissue compress-and-follow style strokes combined with gentle rocking of the hips to release the IT band beginning at the greater trochanter and ending just lateral to the knee. This resulted in a strong physical release down the entire right side of her body accompanied by vivid, colorful imagery. This was the end of the bodywork processing segment of this session. The practitioner then proceeded with closure as described in the last phase of the treatment plan, and the practitioner prompted the client to verbalize the connections that she had made during the session before leaving. Session 2: The client arrived reporting that she had a stiff neck after sleeping poorly the previous night. After the initial greetings and touching-in described in phases one and two, the practitioner began with passive joint movement of the head and neck, followed by traction applied at the occipital ridge. After applying Shiatsu compressions along the sagittal suture of the skull, the therapist used deep tissue compressions to release the frontalis muscle of the forehead as well as the masseter muscle of the jaw. While working in both of these locations the client experienced intense emotional release consisting of clenching of her hands followed by loud sighing and vocalizations of anger and frustration. The client noticed that the anger seemed to be “trying to escape” down her neck toward her right arm and so the therapist skin-rolled down the right side of the neck, across the shoulder and down the right arm, resulting in yet another loud sigh and a visualization of the anger leaving her body. In order to maintain balance in the client’s body, the same pattern was performed on her left side. At this juncture, the client reported a heaviness that had settled in the area over her heart. As a response to this observation, the practitioner responded by addressing the pectoral muscles. The therapist released both sides of the client’s chest using deep tissue compressions and skin rolling techniques. While doing so, the client’s lips began to quiver and several tears escaped as she talked about the feelings that were coming to the surface as a result of work in that area. Work on the pectoral muscles led to a feeling of tension in the client’s abdominal muscles. The therapist performed a few circulatory style effleurage strokes in a clockwise direction over the subject’s abdominal area, followed by several deep Shiatsu style compressions, combined with deep breathing to further enhance the release of the muscles in the area. This was the end of the bodywork processing segment of this session. The practitioner then proceeded with closure as described in the last phase of the treatment plan, and the practitioner prompted the client to verbalize the connections that she had made during the session before leaving. Session 3: The client arrived reporting tension in her lower back and shoulder girdle. After the initial greetings and touching-in described in phases one and two, the practitioner began with passive joint movement of the hips and traction of the legs. This was followed by passive joint movement at the shoulder joints and traction of the arms, and finally with passive joint movement of the neck followed by traction at the head. The client noticed that she was clenching her teeth together and she requested that further attention be paid to her jaw muscles. The therapist complied to her request by performing deep tissue compressions in the muscles that were displaying obvious tension, and by guiding the client in a few stretching exercises that consisted of opening the jaw wide and moving the mandible from side to side. As the client moved her jaw, she was compelled to make throat-clearing noises and to cough repeatedly. As she did so, the client visualized images of symbols that she connected to events that had been causing her grief in her life. The client experienced a tightening of her gluteal muscles and noticed that her back had begun to ache again as she thought about the stressful events. The subject was then asked to move into the prone position on the table, where the therapist focused on the gluteal muscles using deep tissue compressions and rhythmic rocking motions to facilitate release. After completing both sides of the body, the therapist followed up with deep tissue compressions into the sacro-iliac joints. The work in this location was accompanied by loud sighs and exclamations of relief. Next, at the client’s request, the therapist concentrated on releasing both the right and left quadratus lumborum muscles. The softening of these muscles led to a feeling of tension in the area of the thoracic vertebrae. The therapist responded to this observation by first skin rolling the entire back and then using deep tissue compressions to work down the client’s erector muscles from cervical vertebra seven to the iliac crest. The sudden release of muscular tension in this area led the client into a fit of child-like giggles. When the giggles subsided, she reported feeling “warm and safe.” The practitioner then proceeded with closure as described in the last phase of the treatment plan, and the practitioner prompted the client to verbalize the connections that she had made during the session before leaving. Session 4: The client arrived and expressed a need for release in the area of her hamstrings. After the initial greetings and touching-in described in phases one and two, the practitioner began the fourth session with the subject in the prone position on the table. The therapist started with Thai- style palm presses up the subject’s legs and over her entire back. Next, she combined passive stretching of the quadriceps with deep compressions into the gluteal muscles to achieve release. The therapist then focused on the hamstrings using deep tissue compressions combined with breathing exercises and a brief body-part dialogue. The client made several emotional connections, linking the tension in her hamstrings to the pain in her low back. Work on the client’s hamstrings led to a feeling of achiness in her left IT band. The therapist once again addressed the IT band with deep tissue compressions and the rhythmic rocking of the hips. Again, the client experienced vivid imagery and a rush of emotion as the therapist reached the end of the compression, just lateral to the knee. At this time the client reported a feeling that her quadriceps were “stuck to the table.” The practitioner asked the client to move into the supine position, and then addressed the subject’s thighs by rhythmically rolling the quadriceps back and forth across the femur before finishing with deep tissue compressions into the bellies of the muscles. The practitioner then proceeded with closure as described in the last phase of the treatment plan, and the practitioner prompted the client to verbalize the connections that she had made during the session before leaving. Session 5: The client arrived and reported that at that time, she was not experiencing pain or stiffness in any particular region of her body. After the initial greetings and touching-in described in phases one and two, the practitioner began with guided imagery and a breathing meditation with the intention of bringing the subject’s awareness to the areas of her body that were in need of attention. During this time the client visualized many images that led her to new revelations about how her body was being affected by her current life situations. The new connections that she made brought tears to her eyes and a full body shudder. These exercises led the client to express a need for more work on her head, neck and jaw. With the subject in the supine position on the table, the therapist began with deep tissue compressions into the upper trapezius on both sides of the body. Continuing with deep tissue compressions, the therapist addressed the attachments of the levator scapula, the sternocleidomastoid and the scalene muscles. Next, the therapist used deep compressions to release the muscle attachments at the occipital ridge. In this area, the client experienced images that affected her profoundly. As she spoke about her thoughts and feelings regarding these images, her voice took on a very strong and assertive quality. The therapist then performed passive stretching of the subject’s neck muscles before employing passive joint movement of the head and neck, after which the client reported a feeling of floating. While massaging the muscles of the face, the temporalis muscle and the masseter both triggered emotional release in the form of a large sighs and groaning. The therapist completed the work with a circulatory-style scalp massage and gentle stroking of the subject’s hair. The practitioner then proceeded with closure as described in the last phase of the treatment plan, and the practitioner prompted the client to verbalize the connections that she had made during the session before leaving. Headache, experienced almost daily prior to manual therapy, was reduced to an average of 1.5 incidences per week after the first week of treatment. The reduction in headache frequency was maintained through the course of treatment. The intensity of the headaches that the subject experienced was reduced from an average intensity level of 7 prior to treatment to an average intensity level of 2 after the first session and continuing on throughout the following five weeks. These results represent a remarkable change in the subject’s life, gifting her with substantially more productive hours in each week. The average number of days that the subject reported back pain that was severe enough to interfere with her daily activities was reduced from an average number of 3 incidences per week before treatment to an average of 1 incidence per week after the first week of treatment. Over- the-counter medications are commonly used to treat tension headaches as well as low back pain. During the course of this study, the subject decreased her consumption of over-the-counter analgesic medications by 100%. Prior to receiving somato-emotional bodywork sessions, the subject ingested an average of 6 NSAID tablets per week to help alleviate her pain. In the 5 weeks that followed the first session, the subject did not need to use any sort of pharmacological intervention. It should be noted that the subject suffered from a head cold during the final week of treatment. The headaches that were reported during that week could have been a result of the virus that she had contracted as opposed to tension. Since the subject did not specify what type of headaches she had that week, all three headaches were included in and calculated into the totals for that week. If they had not been included, the average number representing the reduction in headache pain would have been dramatically lower. The somato-emotional integration bodywork treatment protocol used in this study was successful in reducing pain associated with tension headaches and the subject’s low back pain. However, components other than massage could be responsible for or may have contributed to the overall effect. For example, the subject was following a regular regimen of specific stretches each morning, as directed by her regular physician in an attempt to alleviate low back tension. This may have contributed to the success of this study in the area of chronic low back pain. It would prove interesting to stage a case study based solely on the effects of stretching on chronic low back pain. The subject in this study observed a meaningful reduction in headache and low back pain frequency and intensity. These findings suggest that a larger, more thorough study that includes a non-headache control group is warranted. Further investigation into the role of somato-emotional integration therapy for alleviating other types of chronic pain is called for as well. The results of this study suggest that somato-emotional integration therapy is effective at reducing the frequency and intensity of tension headaches in this subject. The reduction in headache frequency and intensity was noted during the first week of treatment, which suggests that SEI therapy may exhibit an effect with as few as one or two treatments. The results of this study also suggest that somato-emotional integration therapy is effective at reducing the occurrence of chronic low back pain. Chandler, C., Moraska, A., & Quinn, C. (2002) Massage therapy and frequency of chronic tension headaches. American Journal of Public Health, 92(10), 1657-1661. Retrieved April 30, 2008, from Academic Search Premier database. Collinge,W., Sabo,S. & Wentworth, R. (2005) Integrating complementary therapies into community mental health practice: An exploration. Journal of Alternative and complementary medicine, 11(3), 569-574. Davis, P. K. (1991). The power of touch. Carson, CA: Hay House, Inc.
Dychtwald, K. (1977). Bodymind. New York: Pantheon Books. Goodrich-Dunn, B. & Greene, E. (2004). The psychology of the body. Philadelphia: Lippincott, Williams & Wikins. Hannum, J., Moyer, C. & Rounds, J. (2004) A meta-analysis of massage therapy research. Psychological Bulletin, 130(1), 3-18. Keleman, S. (1985). Emotional Anatomy. Berkeley, CA: Center Press. Maupin, E. (2000). Body epiphany: the somatic viewpoint in bodywork. San Diego: Maupin. Menard, M. B. & Piltch, C. (2008) Massage soothes chronic pain. Massage Therapy Journal, 47(1), 153-155. Osborne-Sheets, C. (1990). Deep tissue sculpting. San Diego: Body Therapy Associates. Tsao, J.C.I. (2007). Effectiveness of massage therapy for chronic, non-malignant pain: A review. Advance Access Publication, eCAM, 4(2),165–179. mental health practice. Massage & Bodywork, Feb./Mar. 140-143. Williams, M.(2007). Managing physical stress can lead to less emotional stress. [Electronic version]. ONS Connect, March 2007, 24.